Flying a drone by line of sight is great fun, but by adding a camera to the front of your drone and streaming the image live to video goggles or a screen, the experience is so much more. The sensation of flying and being in the pilot’s seat is something that has attracted so many people to the hobby and is why it continues to grow. 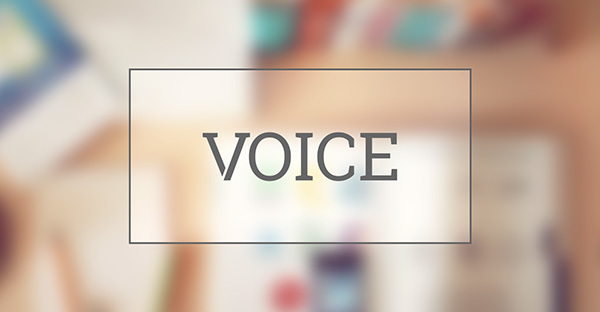 As with any popular new technology, things improve rapidly and there are a lot of options out there. Currently the most popular option by far is to use an analogue camera with 5.8Ghz transmitter. With the camera often limiting the video quality achievable, it’s important to use something that provides a reasonable level of detail, so that you maximise your flying experience. 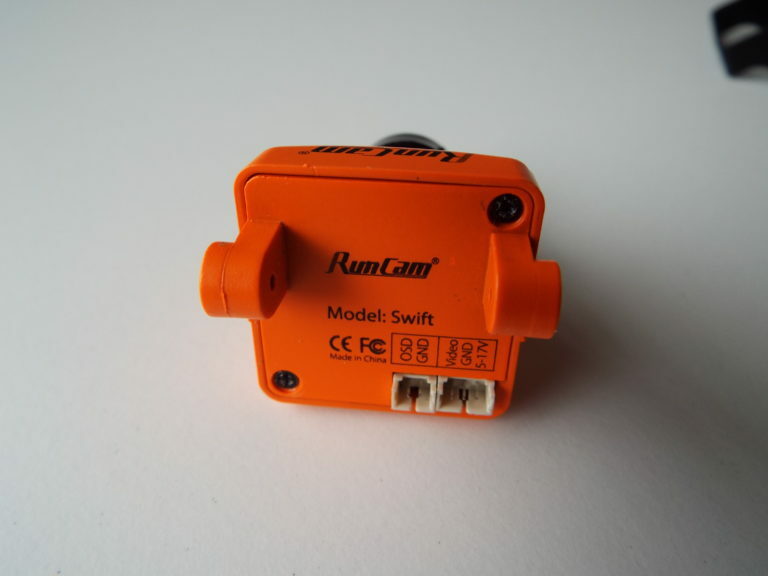 One very good option is the camera we have been using recently, the Runcam Swift. 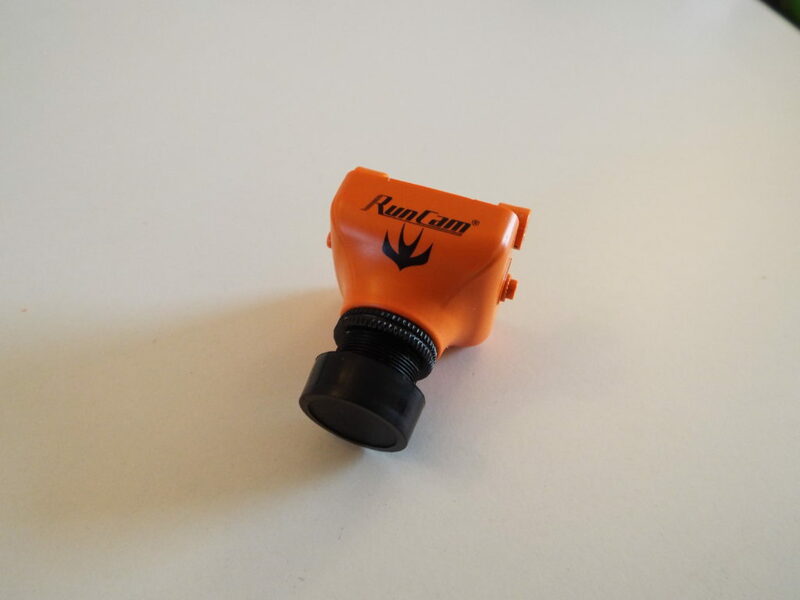 The Runcam Swift is a variant of the popular HS1177 camera, but with a number of tweaks that make it easy to install and use. It has a CCD sensor, which is generally accepted as superior for FPV because of its ability to handle a higher dynamic range and transition from dark to light much quicker. 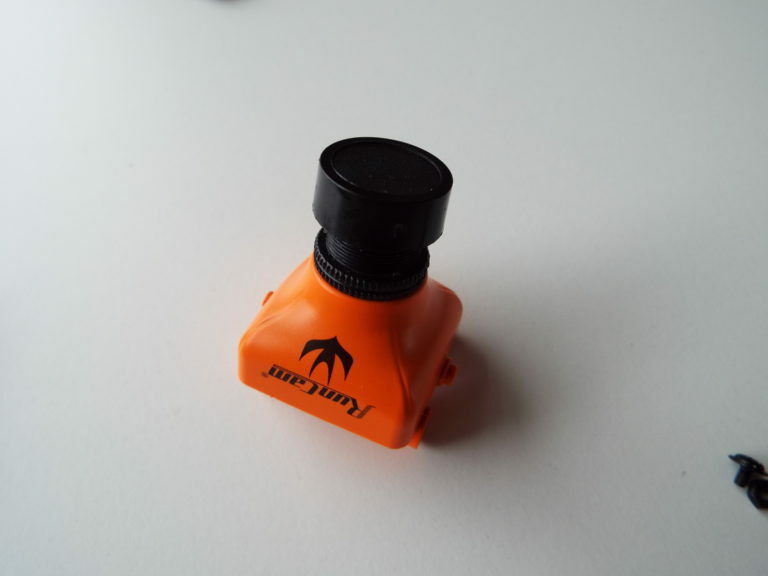 The Runcam Swift comes in black, silver and orange cases with both IR sensitive and blocked options. A number of mounts are included with the camera to maximise compatibility with current and future frames. The cables that come with the camera use silicone wire, which is a nice touch and means that you are less likely to have a broken cable after some crashing and general quadcopter vibrations. The camera can be powered with anything from 5-17V, but we like to use a regulated 12V supply from the PDB. In theory you could power the camera directly from a 2S-4S flight battery, but any voltage spikes or noise would then be passed onto the camera. 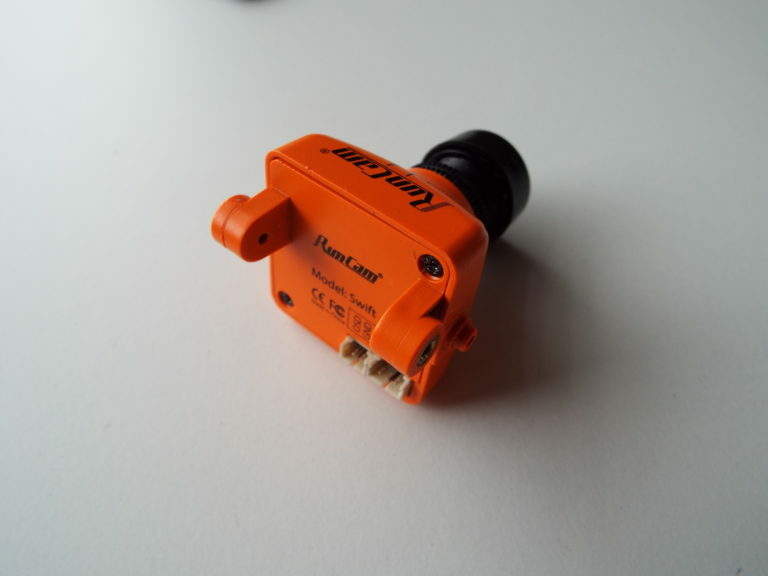 Before using the Runcam Swift we had been using a standard cheap 600tvl CMOS camera. We are happy to report that after upgrading we noticed a very good increase in camera quality. The wide dynamic range makes a huge difference and overall we noticed a significant increase in image quality (we can now see those ghost branches that take you out). In our book, anything that improves the flying experience is very worthwhile. The Runcam Swift comes with a separate osd/menu cable, that allows you to modify the camera settings without running a video pass-through. Instead, the video is transmitted by your VTX and you can view the video through your video receiver/goggles as normal. This is different to the standard and is partly why we chose to use this camera over others. Another nice feature of the OSD/menu system is that you can add a simple text overlay with your name on, making it easy to find your video feed when flying with others. Unfortunately, both the power/video and menu cable connections are at the bottom of the camera and so can foul the bottom of your frame if running a high camera angle and using the supplied bottom mounting bracket. The top mounting bracket limits you to about 35 degrees, so for those wanting to run the higher camera angles now becoming the norm, you will need to consider a 3D printed mount or a frame that supports mounting the Runcam differently. The other design flaw in the camera is to do with how the image sensor is secured. In a hard crash the sensor can break loose because the case back door does not hold the circuit board firmly enough. This can be easily resolved using a thin piece of foam between the door and circuit board and we have not had any problems with either of the Runcam Swift cameras purchased. We have had some very heavy crashes but have not experienced any issues, so do not think durability is a problem once the foam fix is conducted. As well as the foam modification already mentioned, we replaced the standard 2.8mm lens with a wider angle 2.5mm GoPro HD Hero 2 lens. These are readily available and the modification increases the field of view, providing better peripheral vision. When racing or flying through tight turns this helps seeing around corners and also means if your camera angle is too high or low you can still see reasonably well, rather than just seeing sky/ground only. Being able to change the standard lens with a reasonably cheap alternative is a big plus in our books as it provides longevity if you break a lens in a crash and also provides customisation options. Camera tilt is limited to about 35 degrees with the provided mounting options. We love the Runcam Swift and for the money it is a great upgrade. The camera has some downsides, but nothing that cannot be overcome with some minor modding that any drone builder should be used to. The price tag may seem hefty if you are used to buying cheaper CMOS alternatives, but the improvement in image quality is certainly worthwhile for all but the most basic budget builds. Flexibility provided by multiple mounting options, interchangeable lenses and an easily accessible menu to change settings all add up to make this our favourite when it comes to FPV cameras.